Two years ago, I started to learn Chinese Zheng (筝musical instrument) just because I found its tone color could best represent the Chinese classical music, but eventually I found myself falling in love with the beauty of this unique musical world. Chinese art usually goes with the enchantment of nature, and nature always echoes with human feelings, the personal feelings are, in reverse, reflected on the work of art. Here is an example of the Chinese Zheng筝 performance. The piece is known as A Moonlit Night On The Spring River (春江花月夜). It is famous for the beautiful scenery it evokes and for its feelings about passing human existence. The moon rises with the tide, the river sparkles in the moonlight. The poet is said to seek the meaning of life. He recognizes human frailty and transience by comparing the limits of human life with the eternity and constant renewal of nature. And with the river’s rise the moon uprises bright. And where the river flows, there overflows her light. The blooming flowers in her light all look like snow. Nor from white sand upon Farewell Beach below. A lonely wheel like moon shines brilliant far and wide. Who by the riverside first saw the moon arise? When did the moon first see a man by riverside? From year to year the moons look alike, old and new. But hear the river say to its water adieu. On Farewell Beach pine away maples green. Where is the wanderer sailing his boat tonight? Who, pining away, on the moonlit rails would learn? It should have seen the dressing table of the fair. She washes but can’t wash away the moonbeams there. She’d follow it to shine on her beloved one’s face. Nor can letter-sending fish leap out of their place. Last night he dreamed that falling flowers would not stay. Alas! He can’t go home, although half spring has gone. The moon declining over the pool will sink anon. It’s a long way between southern rivers and eastern seas. How many can go home by moonlight who are missed? The sinking moon sheds yearning o’er riverside trees. I’ve been asked many times: Which is harder to learn, Chinese or Japanese? Well, the latest time finally inspired me to make this graphic. I think it’s pretty self-explanatory, but some notes will follow anyway. In case you couldn’t figure out from the graph, both are difficult, but in different ways. Both have insane writing systems and lots of cultural background to learn, so those basically cancel each other out. Any language requires lots of vocabulary memorization. Japanese has loads of loanwords from English, but really learning to use the loanwords like a native speaker instead of a crutch is not so easy to do, so I left that factor out as well. For me, the major points of comparison come down to just pronunciation and grammar. Japanese pronunciation is quite easy at first. Some people have problems with the “tsu” sound, or difficulty pronouncing vowels in succession, as in “mae.” Honestly, though, Japanese pronunciation poses little challenge to the English speaker. The absolute beginner can memorize a few sentences, try to use them 20 minutes later, and be understood. The real difficulty with Japanese is in trying to sound like a native speaker. Getting pitch accent and sentence intonation to a native-like level is no easy task (and I have not done it yet!). Chinese pronunciation, is, of course, maddeningly difficult from the get-go. It can be so hard to make yourself understood when your sentence is only three syllables long. Yes, I know. I’ve been there. If you keep at it, though, things get waaayyy easier. And in the later stages, accent isn’t as big a deal in Chinese. There are so many wildly different accents in China alone that once you get your tones under control and can string a coherent sentence together, Chinese people will often assume you’re a native speaker in telephone conversations. Chinese grammar starts out fairly simple for English speakers. 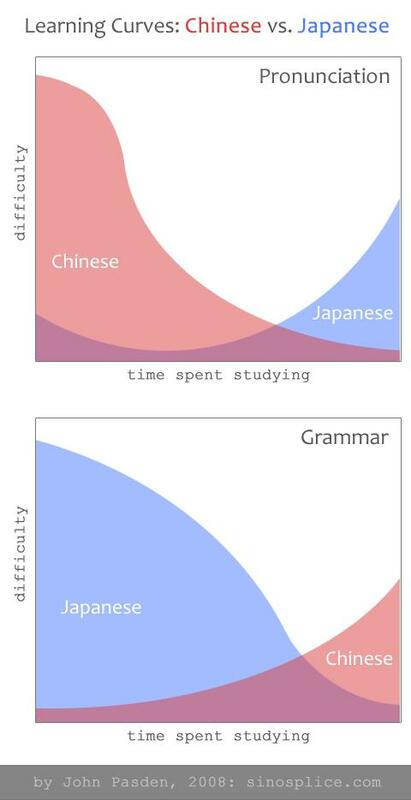 Some find it so simplistic that they say things like, “Chinese has no grammar.” This is not true, of course, and there are a few difficult points to master (like 了, which probably occupies a good chunk of the red area in the middle of the grammar graph), but overall, the grammar is not too rough. If you want true mastery of the language, however, you will also eventually have to study 古文 (ancient Chinese), and that’s quite a bit more work. Japanese grammar starts out seeming like some bizarre alien code. However, through hard work and determination, the persistent can eventually crack it. Once you get over the grammar hump, and verb conjugations, causative-passive,　は and が, and keigo are no longer a big deal, you’re in a pretty comfortable place. But it sure is rough at first. Just to be clear, this is all based on my personal experiences as a very acquisition-conscious language learner, not on scientific research. Please feel free to add your own experiences with these two languages in the comments.